It’s been a long time since our last episode. Sorry, sorry, sorry! Moritz was/is busy with Emoto and the London Olympics, Enrico is moving (with the whole family) to New York City. In this episode we have the honor to talk with “data illustrator” Stefanie Posavec. 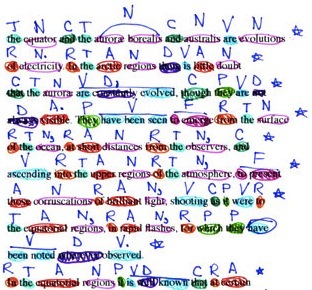 Stefanie makes fascinating hand-crafted visualization like Literary Organism and (En)tangled Word Bank. Most of her work is done by hand, like the highlighted text of Jack Kerouac’s On The Road, and this is so intriguing that we wanted to know more about this process. You can also see her recent Eyeo Festival 2012 talk to know more about how she works. 00:04:42 Enrico will move to NYC! 00:32:08 Manual effort creates “weight”? 00:47:50 Code vs manual layout – should Stef learn to code? Fun talk 🙂 a ray of hope for people who dnt know coding but swear by illustrator. At the end of it its about the passion you feel for the project I guess, the tool set will find its way. Thank you for this podcast. Thanks! Great to hear you like the episode. Yeah, the emoto data is very interesting. I hope I find some time to work on it properly over the next few weeks.